Mario Quiroga of East Chicago, IN. passed away on Thursday April, 11, 2019 at Community Hospital in Munster, IN. surrounded by his family. He was born on Nov 17, 1961 in Chicago, IL. to Homer and Josephine Quiroga. 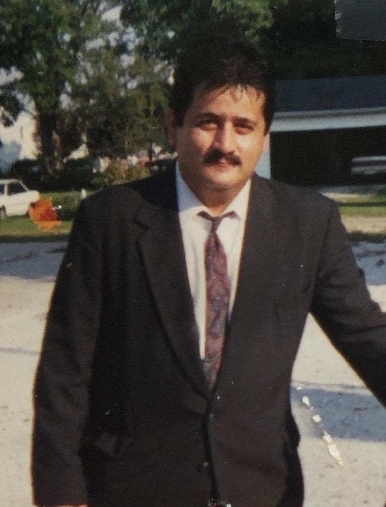 He was survived by his daughters Laura Quiroga (Rafael Casas) of Hammond and Lynn Schilling (Mark) of Valparaiso, son Mario Dunn (Priscilla) of Gary, IN and his girlfriend Kathie Gilbert of East Chicago. Mario has eight grandchildren Abel, Gracie, Julian, Emily, Isabel, Isaac, Kayla and Kyle. He was loved by many especially his siblings Irene Insley (Bill) of Chicago, IL, Charles Gonzalez (Dolly) of Schererville, Linda Dziezak (Ray) of Hammond, Yolanda Ramirez (Jose) of Hammond, Joann Ramirez of East Chicago, Simon Quiroga (Lucy) of Fort Wayne and Blanca Quiroga of Hammond, IN and lots of nieces and nephews. Mario was a loving man who had a big heart. He loved working on cars and houses and helping people. He was self-employed and loved spending time with his grandkids. He loved to keep everyone happy and smiling. He is a shining light that will be truly missed. A visitation will be held Monday, April 22, 2019 at The Acevez Funeral Home from 4 to 8 pm. With a prayer Service at 7:00 pm with Rev. Theodore J. Mens officiating. Family and friends may meet at the Funeral Home, Tuesday at 10:00 am for closing prayers and a burial will follow at Elmwood Cemetery , Hammond.